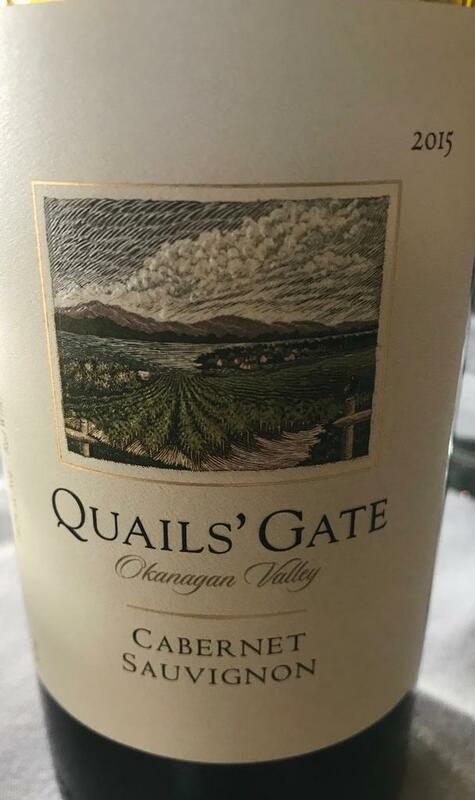 We have traveled to the Okanagan wine country in British Columbia many times, and each time we make sure to stop at Quails’ Gate. Is it because of the delicious wine? Or the wonderful food? Or maybe it is because of the magnificent views of the vineyards, lake, and mountains? The answer is an unqualified “yes!” to all three! And this time we found a fourth reason to love Quails’ Gate – two beautiful lodging options located at the base of the estate on the shore of Okanagan Lake. The Lake House, which can accommodate up to 10 people, features a dream kitchen, luxurious gardens, patios and entertaining areas. The Nest, which is located closer to the shore, is somewhat smaller (accommodates 7 people) and is a little cozier. The Nest is also right next to the Green Bay Wildlife Sanctuary and its many walking trails. Both offer stunning views. Either would be a stunning location for a family reunion, retreat, business conference or just a great get-away. 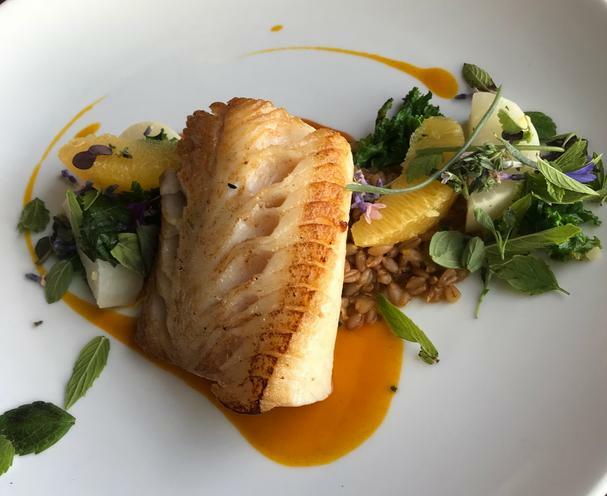 If you are lucky enough to be spending a few days at either The Nest or the Lake House, it might be tempting to stay in for dinner, but you wouldn’t want to miss the experience of dining in the Old Vines Restaurant – located next to the winery tasting room. The Culinary Director and Winery Chef, Roger Sleiman has over 20 years’ experience, the last 10 here at Quails’ Gate. Before that, he worked at Whistler B.C. He is also an alumna of the Wine Executive Program at UC Davis Graduate School of Management. The restaurant area is long and narrow – so that every table has a view of the vineyards and the lake beyond. On a warm summer evening, it is hard to pass up the chance to dine on the patio, or at one of the scattered seating areas around the courtyard. Wherever you choose to sit, you are in for a delightful meal. We started with Asparagus and Dill soup. The asparagus was from nearby Armstrong B.C. – well known for its spring asparagus crop. The soup was delightful, with just a hint of dill to balance the earthy undertones of the fresh asparagus. We then moved on to the Duo of Peace Country Lamb. Sourced from Innisfail Alberta, both the shoulder and chop (hence the ‘duo’) were tender and flavorful. We paired the lamb with the 2015 Cabernet Sauvignon. The wine was a beautiful deep purple in the glass, with notes of blackberry and anise, and a lush, deep finish. It harmonized perfectly with the lamb. We also much enjoyed the Veal Rack Chop – prepared with lemon, garlic, and thyme and served with morel mushrooms, fried almonds and fregola (a pasta originating in Sardinia, with a soft, chewy texture). This paired very well with the 2015 Merlot, an elegant wine with taste notes of ripe red fruit and cocoa. Another highlight was the 30 Day Dry Aged Cache Creek Beef Ribeye, served with lemon butter potatoes, green garlic and arugula. The process of dry-aging dramatically enhances both the flavor and tenderness of the beef – and this one proved the point! We enjoyed the beef with the 2015 Boswell Syrah. This Syrah is a single varietal wine, which is a medium to full-bodied wine with taste notes of plum, olive, and berries. Our biggest meal-time challenge is usually choosing dessert. This time we went with the Lemon & Peach duo. 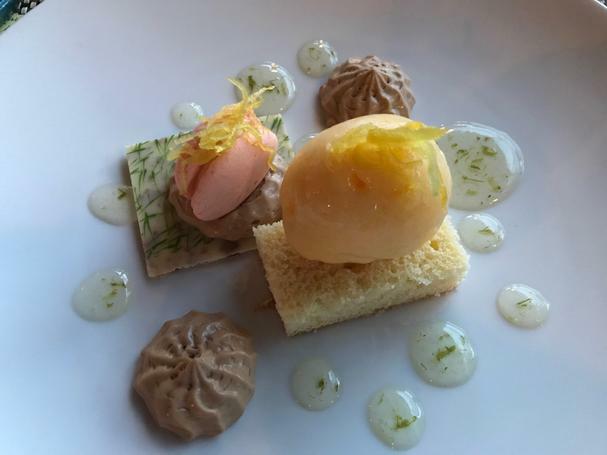 It was a lemon cake, served with caramel vanilla mousse, ice-wine gel, and peach sorbet. The refreshing taste was greatly enhanced by the 2014 Riesling Ice-wine. Icewine is made from grapes which are harvested and crushed after they have frozen on the vine – which makes for a lovely sweet wine. The outstanding ones have a light and refreshing mouthfeel and are not overpoweringly sweet. This one is definitely a good one! When we travel in Canada and enjoy the many delicious wines offered, we always ask if we can get them back home in the states. Sometimes you just need to go back to Canada for your next drink of that favorite. Quails’ Gate wine is actually available in several states (including Washington – yay!). Check here for availability in your area. The folks at Quails' Gate are very excited about their expansion plans. They have recently acquired an additional 200 acres southeast of Kelowna. Their plans for this new location (a twenty-minute drive from the main winery) include a new winery, tasting room and restaurant. Viticulturist Chad Douglas gave us a tour of the new property, where we saw a lot of tiny plants – which will be producing grapes in a few years. Chad grew up in New Zealand and wrote his Masters Thesis on the climatic limits of viticulture in New Zealand. More recently he spent 7 years in the wine industry in Oregon. 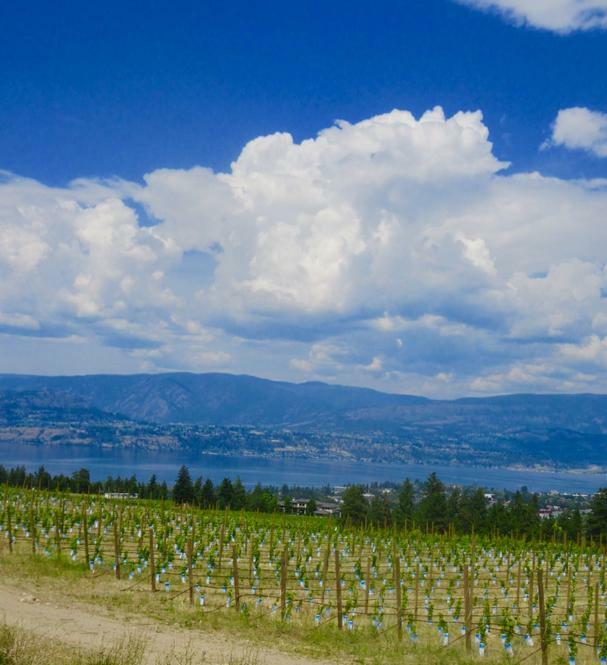 One of the significant challenges and gifts of the Okanagan area is the vastly different soils, aspects, cold spots and “mini-climates” of the area. He showed us a map of 9 fields with each field divided into many blocks with different soils and growing conditions. The plan for the new land is to plant Chardonnay, Pinot Noir, and Chenin Blanc primarily. The gravelly soil from glacial deposits in the new location is different than the volcanic soil at the main property. Of course, any trip with all that eating and drinking needs to include some hiking! We found three great hikes in the area. Boucherie Rush Trail is a 5-minute drive from the vineyard. The hike is 3.7 miles (6 kilometers) roundtrip with less than a 1000 foot gain (275 meters). If you are there in May, you’ll see lots of wildflowers. During the early spring through late fall, you’ll enjoy magnificent views of Okanagan Lake from the top of Mt. Boucherie. Kalamoir Regional Park is a 20-minute walk (or 5-minute drive) from Quails' Gate. There you will find 4 short trails to enjoy. 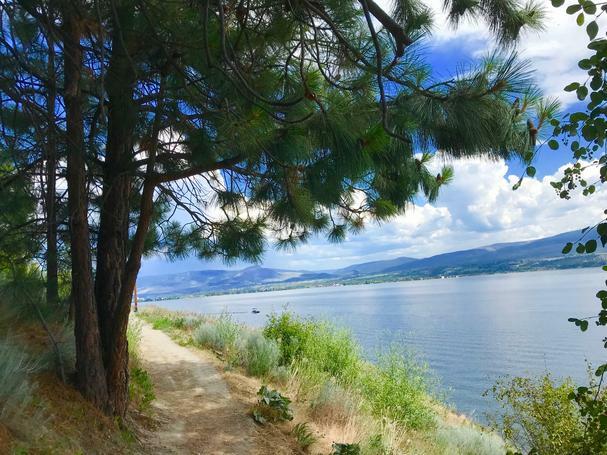 I liked the Sunnyside Trail which is just above Okanagan Lake and has great views. I saw many folks enjoying swimming on this warm sunny day. Kalamoir Regional Park is only one of the 30 regional parks in Central Okanagan to enjoy. 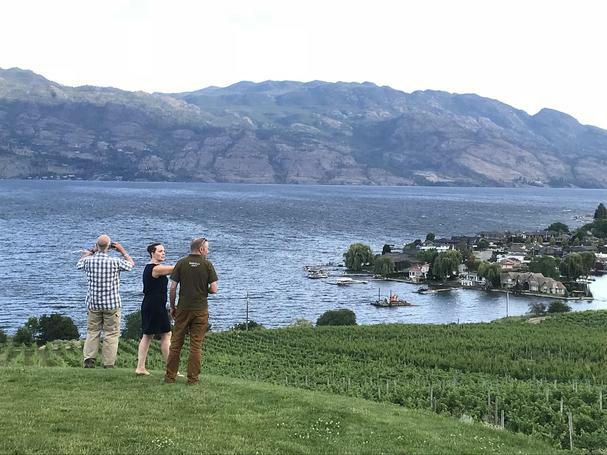 But, the day was clouding up, so we headed back to Quails’ Gate for our favorite summertime competition – deciding which wine goes best on a summer day! Rose, Chardonnay, Chenin Blanc? The jury is still out, and research continues!